Hello, everyone! This is Seikatsu Kakumei’s PR and sales team. It’s been over half a year since our last event rental report. Anyway, as for our Robot Party Reception Service, we’d like to ask those who haven’t yet used it to pay attention. Of course, we’ve been hearing a lot of comments like, “Aren’t you going to show any case examples?”, so we’ve been called to update this blog. Here, we’re going to show you a case from November of last year, a rental and dispatch of our Robot Party Reception Service for the Animal Clinical Medical Society. If you happen to be wondering, “What’s Robot Party Reception Service?”, please see the details below. 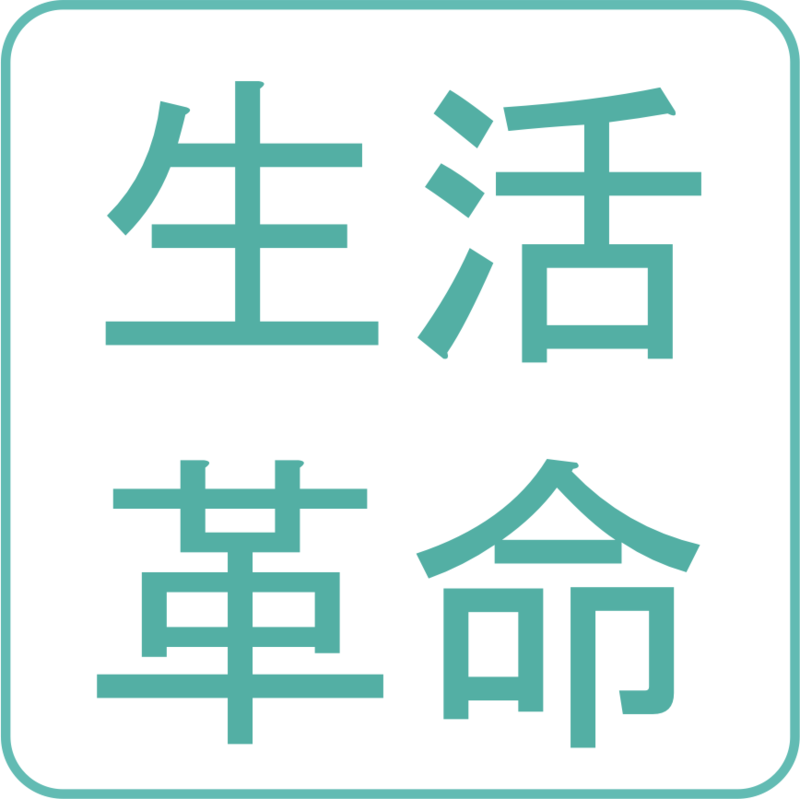 This event took place in an Osaka convention hall, at the yearly meeting of the Animal Clinical Medical Society. Taking interest in our robots that can walk around and talk about anything, and working with the event hosts, the order was for us to explain the information of the trade show booth at the exposition. We stuck it onto Pepper’s nose, which doesn’t normally stand out. Then, we added ears, and as you’ll see if you look, a tail. This pleased the client very much. Many guests, ranging from students to professors to drug manufacturers were present. Standing alongside the event host, Pepper went around calling the guests over while giving presentations about the company’s branding and products. an exceptional balance of customer outreach and branding awareness was achieved. Along with providing strong branding to the customers, in getting a positive reaction from the inside (those within the client company as well as the event host), it seems we also did well in raising motivation within the company and creating an end-of-year milestone. 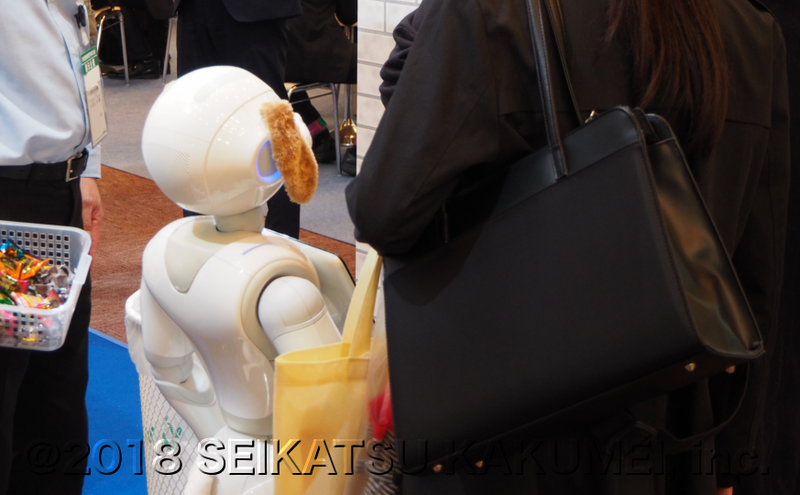 At Seikatsu Kakumei, we support robot use (including rental, dispatch, planning, and operations) for not only this type of veterinary fair, but also parties, trade exhibitions, promotional events, family customer events, and more. If there’s any way we might be able to help with your corporate event, please be sure to consult with us. Here is a summary of Seikatsu Kakumei’s robot event business. 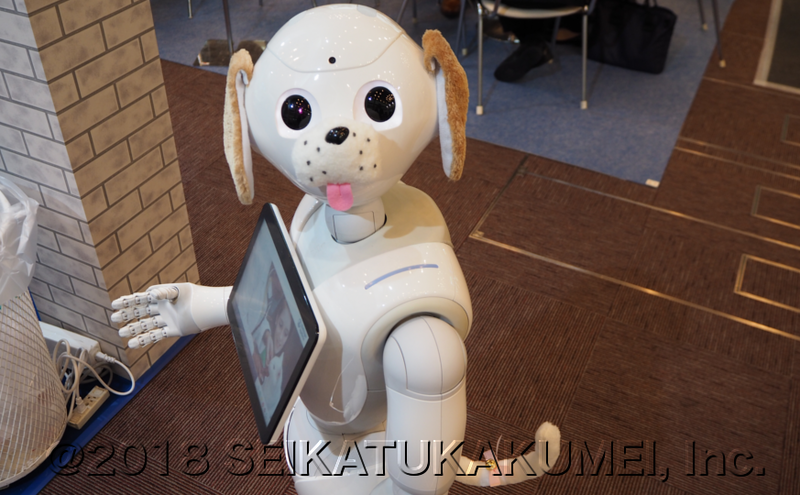 Alongside the event host, during the two-day expo and both in and outside of the booth, Pepper wore a dog costume and went around calling out for customers. By talking along with the event host and client staff, attracting customers, explaining the company’s topics, and chatting, the company’s favorability was raised. Even within the client company, Pepper continued working, bringing everyone a fun time and warming the hearts of everyone who had come from far away. The trade booth became a great success. Seikatsu Kakumei’s Robot System a Big Hit at Aqura Home’s Big Thanks Event!